In 1993 Her Majesty the Queen awarded Fiennes the Order of the British Empire (OBE) because, on the way to breaking records, he has raised over £17 million for charity. He was named Best Sportsman in the 2007 ITV Great Briton Awards and in 2009 he became the oldest Briton to reach the summit of Everest, raising a total of £6.3m for Marie Curie Cancer Care. The Coldest Journey in 2014 raised $2million for Seeing is Believing. In 2015 he successfully completed the Marathon des Sables raising over £1 million for Marie Curie. He has written 23 books, the latest Cold came out in 2013 and his latest book Agincourt was published in September 2014. His latest book, ‘Heat’, will be released in October 2015. He is described by The Guinness Book of Records as “the world’s greatest living explorer”. Motivational, Teamwork and Achieving versus Adversity Presentations by Sir Ranulph Fiennes OBE . 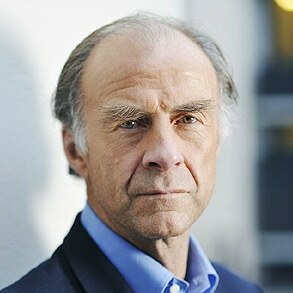 Sir Ranulph Fiennes has been titled by the Guinness Book of Records as “The Worlds Greatest Living Explorer”. Daily Telegraph 2000 listed Ranulph Fiennes as “One of the world’s top ten speakers”.